Sigmund Freud, the father of psychoanalysis, famously died in London, and there is even a museum at his former home. 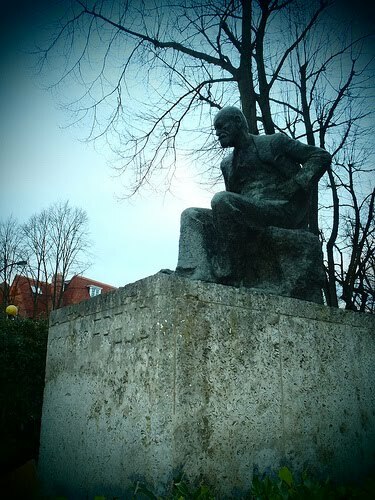 Nearby, on the corner of Fitzjohn's Avenue and Belsize Lane, a statue of the great man keeps watch over the area in front of the Tavistock Centre. The seated sculpture was created by Freud's long-time sculptor Oscar Nemon, following meetings in London in 1938 after both men had had to leave Europe, fearing for their future as Jews in an increasingly uncertain time. Nemon's website notes how these later sittings, and Freuds advanced age led to a harsher more abstracted portrait of the great man, which became the head for the seated bronze we see today. one of the practioners of the clinic once said to me that the statue was erected by Camden Council - nothing to do with the clinic he said! We are all Jungians not Freudians! For all the times I've stayed in Hampstead, I've never gone a lookin'. I should do that next time.